The Taragalte Festival takes place at Bivouac Le Petit Prince, a desert camp 7km from M’Hamid. The camp lies in the last oasis before entering the expanse of the vast Sahara Desert. Once a year the calm and tranquil camp turns into the most vibrant main meeting area of the festival. Let us help you with a simple packing list: - Scarves (for covering up and against sun and wind) - Both cool and warm clothing is necessary, days get pretty warm, nights are also still warm but can get fresh when windy (bring 1 warm jacket/fleece/sweater) - And yes ...it can also rain in this part of the year ...Sunscreen, lip balm, wet wipes and cotton buds (super handy!) - Flashlight/small headlight - Sunglasses - Towel / sleepingbag (if you have the basic camping package) - ORS and immodium, basic first aid Packing light is recommended; clothes can be rinsed and dry quickly. Book our packags and we will take care that you arrive happy and safely at the festival site. If you travel by bus, you find the festival office at the CTM stop in M’Hamid. The festival will arrange the transfer to the festival site. If you come with your own car, you can follow the marked signs directly to the car parking at the festival entrance. Always check in at the festival office before coming to the site. M'Hamid El Ghizlane, 'plain of gazelles' is a oasis town in southern Morocco (Zagora Province in the Drâa-Tafilalet Region) with about 7500 inhabitants. M'Hamid lies at an altitude of about 500 meters above sea level and about 24 kilometres from the Algerian border at the edge of the Sahara. 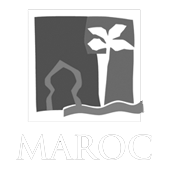 M'Hamid can be reached at the end of National Route 9 from Ouarzazate (260 km) via Zagora (approx. 97 km). The festival site is located about 20 minutes from the village by 4x4 so the festival will bring you directly to the sand of the Sahara!